Goodreads Summary: And their doom comes swiftly. I don't often read a lot of murder mysteries or horror stories, but this modernization of an Agatha Christie play was impossible to pass up. 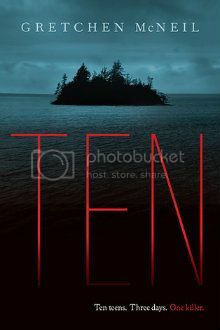 Ten was the perfect book to read on a dark, stormy night for full effect (or during a bright, sunny day if murder mysteries aren't your thing). What happens when ten teens are isolated on an island during a terrible thunderstorm? Like every horror movie expert knows: Murder. What Meg thought would be a fun - or at least possibly fun - weekend with her best friend Minnie and other local teens turns deadly after they watch a DVD with a murderous message. With each minute that passes, it seems more and more likely that the killer responsible for a recent murder has made it to the island and is now after everyone inside. With no chance of outside aide, Meg knows that it's up to her to find the killer...or risk being the one who's killed next. First things first: Ten might be a murder mystery, but there is much more to the story. Gretchen McNeil brings a fresh voice to the YA market with a bit of snark that brought the characters to life. Within the context of the mystery we get to know all of the characters, especially Meg and T.J. Meg has always been a loyal best friend to Minnie and often in her shadow, but throughout the novel Meg really comes into her own. Minnie might have a crush on T.J., but as Meg and T.J. are thrown together in trying to solve the mystery, it becomes clear that they have a connection. Yes, somehow Gretchen McNeil manages to develop a really sweet romance in the midst of a suspenseful mystery, and it makes the story all the more enjoyable. Ten is a book that you can't put down. Even before the murders begin there is never a dull moment, and after the first body is found the suspense builds right until the end. I loved the way that everything was tied together and how there weren't holes in the plot. The book will certainly keep you guessing right along with Meg about who the murderer really is. If you enjoy murder mysteries, you will definitely want to add Ten to your reading lists. I know that I will look forward to reading more from Gretchen McNeil!